This is a prize of a picture that was sent to me by Daniel Sedory, one of the blog’s followers. 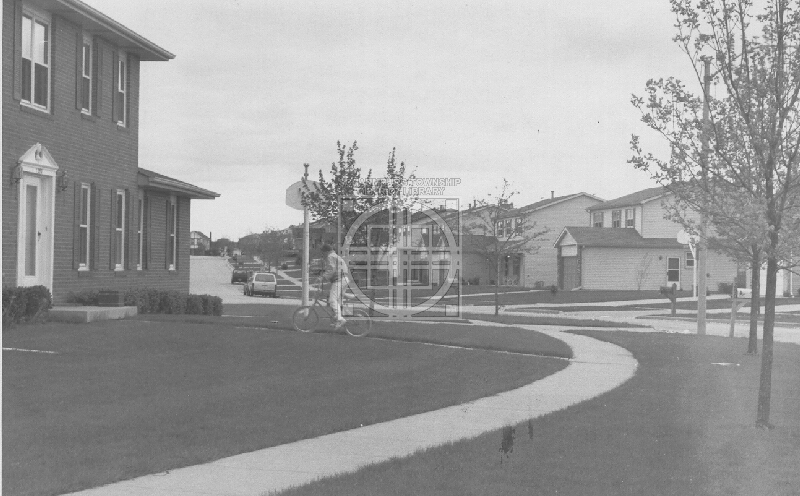 It is a great representation of 1960’s Hoffman Estates complete with new bike, old car from the 1950s and brand new houses along Bode Road. The bike came from a bike store on Roselle Road and the day Daniel picked up the bike he rode it home. Thinking the store might be Bike Connection just north of the intersection with Golf Road–and knowing it had been there awhile–I stopped by and talked to owner, Rick Johnson. He said the store opened in the early 1970s so that notion fell through. It might be possible that one of this blog’s readers remembers the bike store it might have been? The backdrop of the photo then leads us to a car that looks to be from the 1950s. I wasn’t too sure about the make and model until one of our readers told me it was a 1952 Mercury Custom sedan. It looks neat sitting in the background. 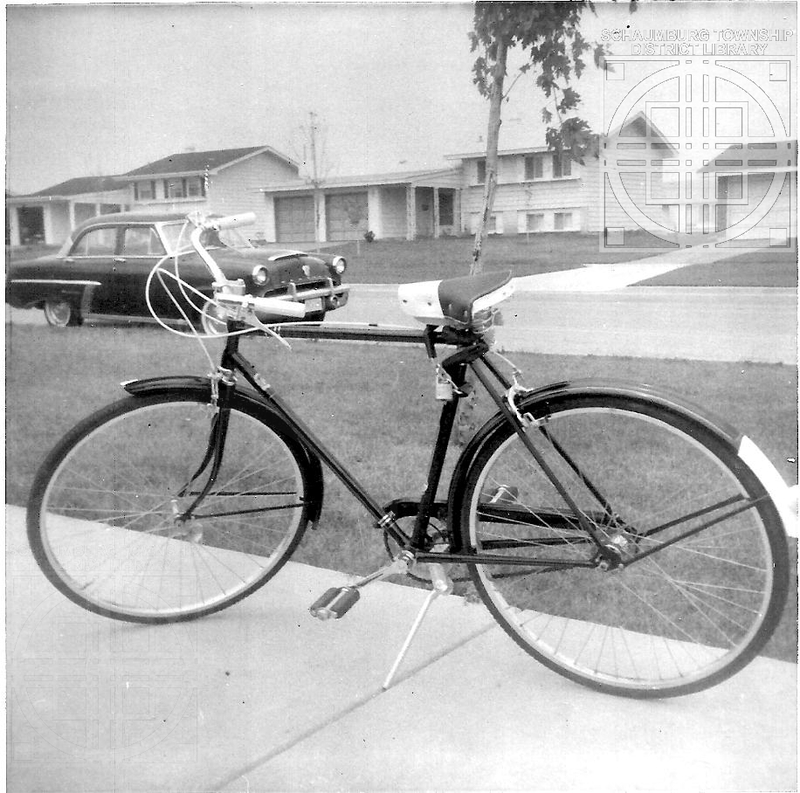 And, then there’s the new houses that surround both the car and the bicycle. According to Daniel, the photo was taken outside of, what was then, 290 Bode Road. The Sedory’s were the first owners when this house was built in 1960. This area of Hoffman Estates is part of the Parcel C development that was constructed by F & S Construction. Curb and gutter have been installed along the streets and the grass is growing quite nicely but the tree is not yet mature. It is still a very new street. 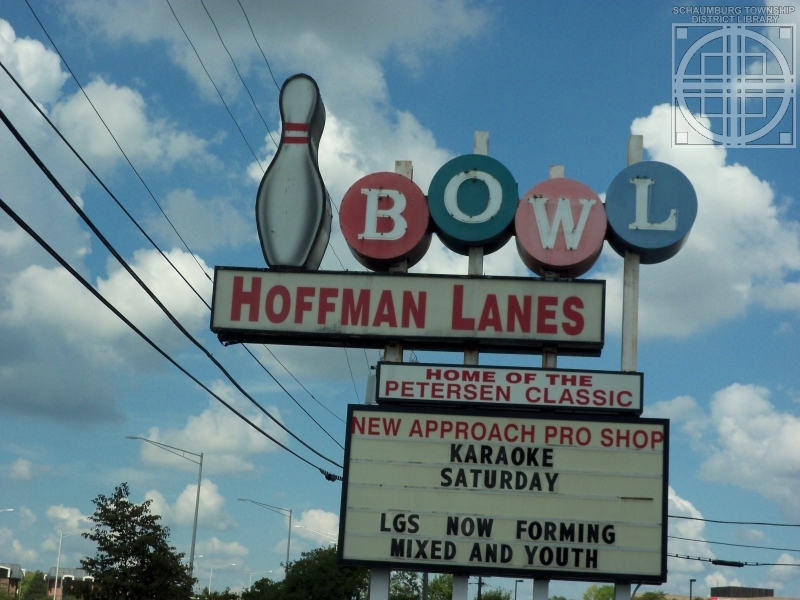 All in all it is a neat juxtaposition between new and old–and a great photo of early Hoffman Estates. Thank you to Daniel for passing it on with so many details included. My thanks to Rick Johnson at Bike Connection for providing me with details on the bike as well as the logo. His helpfulness helped advance the story you read here. In cataloging some photos for our library’s Local History Digital Archive, I came across this unidentified street. 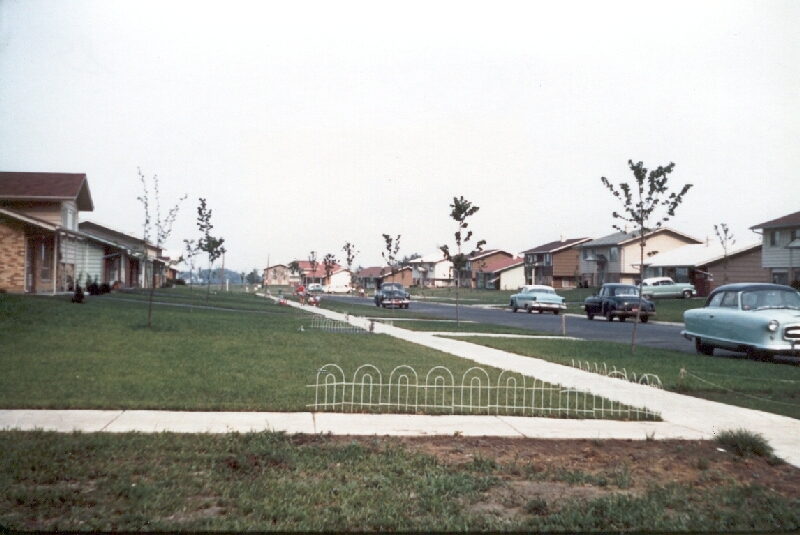 The back of the photo mentioned that it was taken in 1990 and was a “Schaumburg neighborhood.” It’s clearly a newer subdivision judging by the size of the trees and the bushes. And, there’s a fairly substantial hill–for Schaumburg Township–in the background. Not having any idea how to start trying to identify the location, I turned to Larry Rowan of Coldwell Banker, a neighbor of ours in Town Square. Knowing how familiar the realtors are with the streets of Schaumburg Township, I was hoping they could pinpoint the street and/or subdivision for me. Larry could tell it seemed to be a mix of homes where two subdivisions were merging together. Liking a good challenge, Larry went on a drive and checked out his two suspicions. And then checked some more possibilities. None proved to be correct so he broadened his search to include Hoffman Estates. After much driving through neighborhoods he discovered that this home was, indeed, in Hoffman Estates. It is part of the URE Addition to Hoffman Estates that is west of Gannon and north of Bode Road. 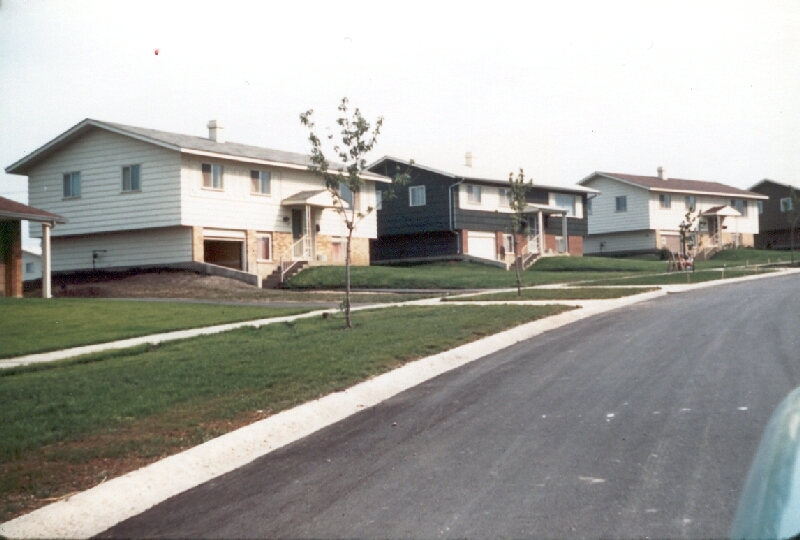 The home to the left was a custom built home and the rest are all tract homes built mainly by Hoffman Homes. Good find Larry! Thank you! Our guest contributor this week is Pat Barch, the Hoffman Estates Historian. This column originally appeared in the March 2013 issue of the Hoffman Estates Citizen, the village’s newsletter. The column appears here, courtesy of the Village of Hoffman Estates. In my December, 2012 article, I talked about the early pioneers that moved into parcel A in 1955-56. I asked for stories from some other early pioneers that might still be in the area and I thank all of you for sending me your families’ stories. Dave Olson’s parents moved into their home on Apricot St. in March of 1956. He quotes from his mother’s (Adeline) autobiography “The house looked fine on the outside, but we immediately noticed that the house had settled on the north side and there was a definite slant to the floor.” After F & S Construction made repairs, they finally moved into their home in June of 56. David remembers being 6 yr. old and having the freedom to run in circles through the house because of the layout of the rooms. The mailboxes were lined up out on Golf Rd. They went grocery shopping in Palatine and to the Pizza Cottage in Roselle for a real treat. He fondling remembers the rock and mudslinging fights that took place on their street. Even after the paving trucks paved the streets, he remembers still having enough ammunition for a good afternoon fight. David remembered other families such as the Daveys, Bartoshes, Hauperts, Yochers, Espersens, Mullendores and the Ewans who lived on their street. David wasn’t the only one who remembered the rocks and mud, Elizabeth also remembered the huge pile of dirt that offered hours of fun playing army. Her home was at the end of Alcoa Ln. and her dad would cut the grass for a baseball field in the summer, build tree houses in the old trees and in winter they’d skate on the small frozen lakes behind their house. She rode past her old home last year and couldn’t believe how things had changed, including the house number. Dan Farinosi shared his story of the springtime move in for his family on Bluebonnet in 1956. He was in the first 6th grade class at Twinbrook School. He remembers the large group of kids his own age and the fun they had playing baseball at the school and endless board games on rainy days. High School was 7 miles away in Palatine and a good pizza was at the Pizza Cottage in Roselle. He’s remained in Hoffman Estates for 56 years and spent his entire career in District 54 as a teacher and principal of Frost Middle School until he retired in 2001. I mentioned the Gluck family in my December article and their son Jon sent a story about his parents and their move to Hoffman Estates in 1955. His dad, was Police Commissioner, he believes it was a volunteer position, in 1970. They moved away in 1978. Naomi wasn’t an early pioneer but she remembers reading about how the early moms got together to form a babysitter club. If you used someone as a sitter, you owed them one night in return. With little to do in the early days our pioneer families relied on themselves and the kids had more friends to have fun with than they had in the city. With open fields for baseball, frozen ponds for skating, piles of dirt for afternoon wars, what could be better than that? Probably a ride to Roselle for pizza. 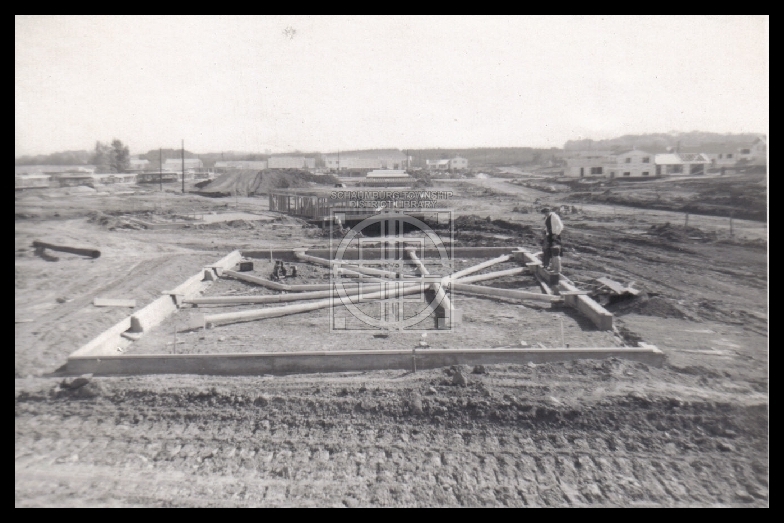 Photo is of an early development in Hoffman Estates and is compliments of the Hoffman Estates Museum. Our guest contributor this week is Pat Barch, the Hoffman Estates Historian. This column originally appeared in the December 2012 issue of the Hoffman Estates Citizen, the village’s newsletter. The column appears here, courtesy of the Village of Hoffman Estates. 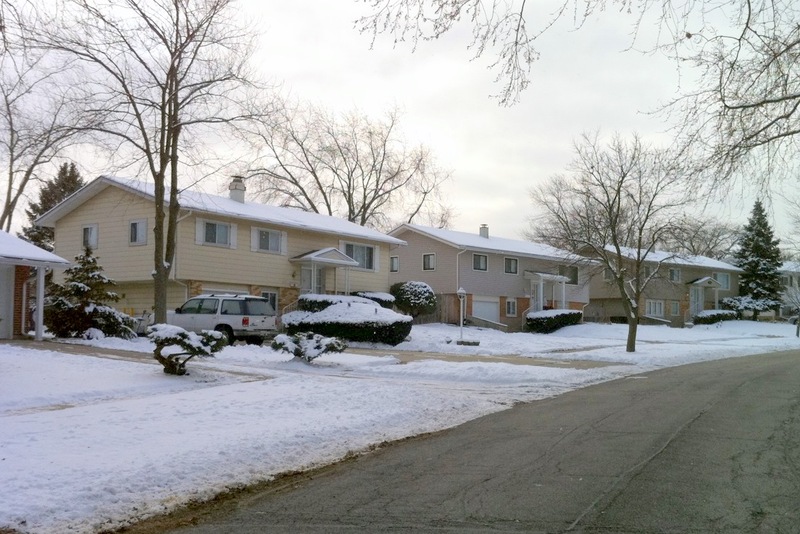 The first residents of Hoffman Estates moved into their homes in December, 1955. I found an article in the Daily Herald dated December 2, 1965, written by Barbara MacEachron that recalls the 10th anniversary of the “Pioneer First Families” move to their new homes. Here are some of the “first families” stories. Just before Christmas, on December 21st, the first baby was born in Hoffman Estates. Little Kathy Irvin’s birth would bring some excitement to the new neighbors on Aster Lane. Parcel A’s new residents were eager to get into their new homes before the holidays. The Gluck family moved into their new home on Christmas Eve. “Christmas day, 1955 is firmly impressed in the mind of Mr. Ted Gluck, 208 Basswood St. ….at 4 a.m. in the morning (they) were trimming their tree in preparation for a family Christmas gathering.” The Gluck family had 4 boys and I can just imagine how exhausted they were from having to shop, wrap and plan a normal Christmas day with the stress of moving into a new home. These families may still be living in Hoffman Estates. E-mail me if you were one of the “first families”. I’d love to hear your stories too. Our guest contributor this week is Pat Barch, the Hoffman Estates Historian. This column originally appeared in the August 2012 issue of the Hoffman Estates Citizen, the village’s newsletter. 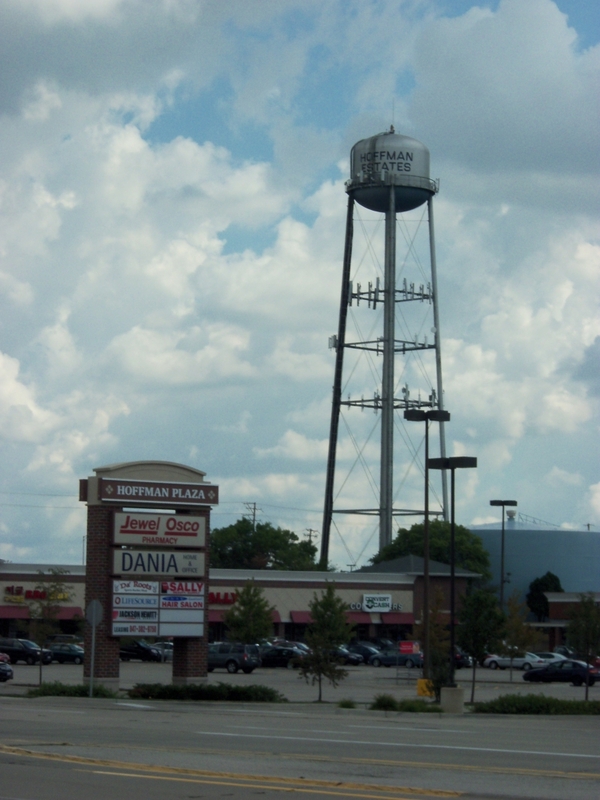 The column appears here, courtesy of the Village of Hoffman Estates. Last week I wrote a piece on Louis Menke, the first major builder of early Schaumburg Township. As it sometimes serendipitously happens, Pat wrote her August column on Jack Hoffman of F and S Construction Co. who built early Hoffman Estates. I think you’ll see he, like Menke, was definitely a busy man. Jack Hoffman was the developer of Hoffman Estates. He gave his name to the town he built. Although he and his dad Sam built their first homes in Phoenix to provide homes for the returning GIs, he was always proud of the village that bore his name. Recently a story in the Neighbor section of the Daily Herald dated 6/26/12 told of the generous gift made by Jack’s daughter Robbie and her husband Scott, to the Jewish Community Center’s “Jews in Blues” program at the Great Lakes Recruit Training Center in honor of her dad’s memory. Jack’s Russian born parents, Sam and Anna Hoffman, escaped religious persecution and fled to the United States. Jack knew firsthand how precious freedom was and joined the Navy in World War II. He trained at Great Lakes and served as a signalman on Navy oil tankers and learned some German along the way. Being Jewish, from time to time throughout his life he experienced discrimination. He grew up in Chicago but moved to Phoenix where he and his father Sam built affordable housing for the returning GIs. Their construction company was F & S Construction Company and later it became Hoffman Rosner and then Hoffman Homes. He didn’t just build homes in Hoffman Estates, he built a community. As part of his planned community he built Hoffman Plaza and Golf Center shopping areas, the Thunderbird Movie Theater (now Royal Buffet) the Hoffman Bowling Alley, the Medco office complex and adjacent apartment buildings. As the homes were completed in parcel A, B, C, D, the Highlands and Highlands West so were the schools. Twinbrook, Fairview, Hoffman, Blackhawk, Lakeview, Hillcrest and Churchill were built by Jack Hoffman with donated land and materials that totaled $1,246,000. The Hammerstein Farm property was also donated to the Hoffman Estates Homeowners Association and the farm house became our first village hall and police department when we incorporated in September, 1959. In the Chicagoland area Hoffman Rosner/Hoffman Homes built the communities of Butterfield, Lincoln Hill, Foxcroft in DuPage county and Southdale in southern Cook County as well as Churchill in Schaumburg. They built homes in Salt Lake City, Cleveland and Denver. A testimonial dinner was given by the City of Hope on February 12, 1966 to award the Torch Of Hope to Jack Hoffman “fund raiser extraordinaire” for his contributions to help research in catastrophic diseases such as cancer and leukemia. Jack was a compassionate and generous man. The memorial donation made by Robbie and Scott Schreiber to the Great Lakes Recruit Training Center will ensure that the JCC programs will continue to provide kits “which contain prayer books, ritual objects, music and meditations that recruits can use once they’re deployed to maintain connections to Jewish practice”. Also “JCC will provide weekly Shabbat programming, holiday services and the opportunities for Jewish learning and exploration.” What a fitting memorial for the father of our village. Jack Hoffman passed away in December of 2008. I was just getting to know him and had so many questions to ask him, just as a historian should. THE STREETS OF WHICH NEIGHBORHOOD? The Local History Digital Archive has these two photos that are of unidentified streets in Hoffman Estates or Schaumburg. The Hoffman Estates historian is fairly sure these streets are in the Highlands of Hoffman Estates. It is obviously a neighborhood of split levels and raised ranches. Can anyone help verify this or suggest an alternative? P.S. Aren’t those cars great? Judging by their style, these photos have to be from the late 1950s or early 1960s. Maybe some of you car buffs can help us distinguish a time frame! ***FOUND. LOCATION OF BOTTOM PHOTO. Due to the diligence of, Larry Rowan, a reader of the blog who actually drove the neighborhood, it has been discovered that these homes are on Jefferson Street—in the Hoffman Highlands. See the photo below taken from the same perspective. Many thanks Larry! ***MORE DETAILS. Marty Oliff, another reader of the blog, also confirmed that this is Jefferson Street in the Highlands. He said, “It appears that the photo was taken looking north from Durham Lane.” He also confirmed a possible time frame of the summer of 1961 since his family moved into 235 Jefferson on March 17 of that year. According to him, the houses going past Frederick Lane and heading up the hill were being built at that time. ***FOUND. ANOTHER POSSIBLE LOCATION OF BOTTOM PHOTO. It was brought to my attention by Roger Tillander that this could also be Gentry Road in Hoffman Estates near Durham, which is also in the Hoffman Highlands. Amazingly enough, the house styles line up on a curved incline in exactly the same way. ***FOUND. LOCATION OF UPPER PHOTO. Mr. Tillander also mentioned that the upper photo is from Amherst and Gentry in the Highlands. ***CAR IDENTIFIED? Mr. Tillander thinks the light green car in the forefront is a ’54 Nash and that the others in the photo are also from 1954 and earlier.